I just returned from a trip to Mexico where I visited family and friends (thus the absence of posts on previous weeks). While driving through Mexico City, or rather, while I was stuck in traffic for hours, I was reminded of an ubiquitous element of the country’s urban landscape: the trunk of each and every tree and shrub in parks, along streets and avenues, is painted white for at least a meter high from the ground. It is such a common feature that I bet most Mexicans don’t even notice it, having grown used to it. I don’t remember seeing this anywhere else but, alas, it is probably because I also take it for granted. The white paint is a mixture of lime and water, and the idea is to keep ants from climbing up the trees. Or so popular belief has it. I guess this is supposed to work by creating a powdery surface to which the insect’s feet can’t hold on. But to be honest, many times I have seen ants happily walking up and down right through the painted surface. Granted, as a good urban myth, I think with time the practice has mutated from covering trunks with lime to painting them white with whatever paint is available, since sometimes the trees have a nice glossy finish to them that is definitely not calcium based. The curious thing about this practice in Mexico is the religiosity with which it is follow. It doesn’t matter if the tree is some thousands of years old or a mere stick, it’s base will be cover in white. Moreover, the ritual is performed even in places where ants aren’t really a problem. I understand if you have to protect plants in, say, tropical Ciudad del Carmen, where I once counted 10 different ant species, including a leafcutting ant (Atta mexicana in this case), on just one of the sidewalks in a street block. But in high-altitude Mexico City or, say, in cold and dry Perote it just doesn’t seem to be a crucial necessity. You can tell when a park have been taken care of not by the trimmed grass, that is dry and yellow for most of the year in the central plateau of Mexico, but by the fresh coat of white on the tree trunks and the white dripping all over the place around them. 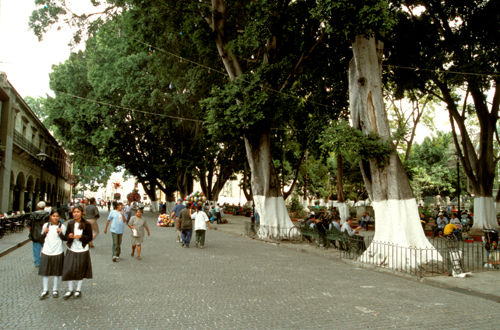 Some years ago I drove pass an avenue in Mexico City where the city’s gardeners were recoating the trees with white. I immediately stopped and got out of the car. This was my golden opportunity to ask the experts itself about the practice and put all my doubts to a rest. I approached one of the men and inquired about his work. Brush in one hand, bucket in the other, he looked at me as if I had just asked him why was he wearing pants to work that day. For the ants, he replied, of course. This seems to be common throughout Latin America- Paraguayans and Argentinians also paint their trees. It doesn’t stop the ants, of course, but it makes them easier to spot as the climb the trunk. In that, it does seem to serve at least some sort of myrmecological function. I recall seeing the bases of tree trunks painted white (not sure with what) in western Arkansas, where I grew up, in the fifties and sixties. It was unusual and old-fashioned even back then, but the old folks, at least, believed it protected the trees from some sort of insect pest. Carol- That is an interesting piece of information. Now I am really curious to find out when and where did this practice originated. I am sure there must be something more technical written in the old applied entomological literature. I’ll keep my eyes open for that. PS: Love the SEM photos and look forward to seeing more of them!